I follow your samples and I simply love this particular stitch. 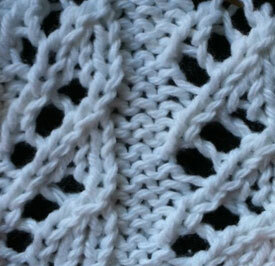 Rather timeless looking and has so many potential uses for this stitch! Love it and love your teachings! Your blog has been an amazing help and inspiration to me. keep up the great work! can i ask what kind of needles you use. I'm trying to like circular needles but find the cord being all twisted up under my work to be insanely irritating. Your cord just seems to lie there - no loops, no extra curling. Hi Jessiegirl - those fabulous needles are addi turbos and yes the cords are very pliable . I had a Boye interchangeable set prior to the addis, and I didn't realize how awful the cord was until I used an addi circular!. If you are a serious knitter I recommend thinking about investing in the click set. I know the click set does seem expensive, however if you were to buy each needle size in each length you'd be spending a whole lot more. It's very handy having the set too. I recently got another cord set for mine; if I am working on something and then need that size for something else, all I have to do is take the needles off, click on another cord and I'm ready to go. I have both the regular set as well as the lace clicks. The lace tips are pointer, which are good for lace but I use them on non lace knitting too. I recommend purchasing them from Evelyn over at www.knitty-noddy.com. She is one of the best online sellers I've come across - great communication and prices are often a bit lower too. I found you via YouTube when looking for a raspberry stitch demo and I'm glad I did. Love the weekly stitch idea - I'll be following along! Boa Tarde ,fui ao yotub ver algum ponto pois estou aprendendo trico sozinha ,aqui onde moro é cidade muito pequena e não encontro quem ensinar-me,foi onde suas aulinhas me chamou atenção e comecei a ve-las ,onde tb encontrei seu vim no seu link e aqui estou encantada com tudo que vi e agora tenho certeza vou aprender alguns pontos diferentes. Muito obrigado por sua dedicação com o seu semelhante partilhando seu saber com quem quase ou nada sabem . I casted on 21 stitches and cannot come up even. not sure what I am doing wrong. Sorry, there needs to be an * on row 6.